Wordless Wednesday: Where are all the birds? 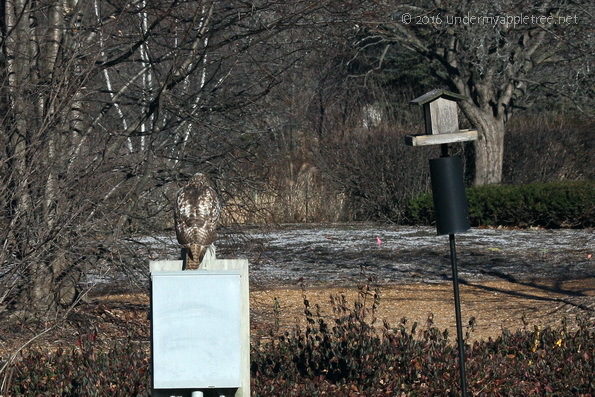 Almost wordless: This juvenile Red-tailed Hawk needs to be a little less obvious if he wants to “hunt” at the feeders. Thank you for the recognition, but I don’t participate in blog awards. Leslie, I saw one of these hawks on my neighborhood walk yesterday! Ha!! We’ve been seeing a lot of hawks lately, but not in our yard. This one was at the park, but I had one in my yard last week. I’m seeing a lot of them too. Maybe because there aren’t any leaves they are more visible.